The vapour steam generated by evaporation of the solution is compressed to a higher pressure and temperature level in the compressor so that it can be used as a heating medium for heating the circulated solution. 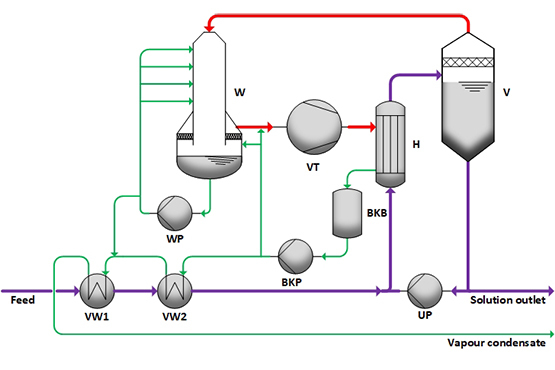 The solution is preheated with condensate in preheaters VW1, VW2 and enters the evaporation circuit. Here it mixes with the circulated solution and is warmed up in heater H. In the evaporator V, solvent (water) evaporates while cooling the solution to the boiling temperature. The resulting vapour steam is washed and saturated with condensate in the vapour scrubber W and compressed to a higher pressure and temperature level by the compressor VT so that it can be used as a heating medium for heating the circulated solution. By continuously concentration and exceeding the saturation line, crystal occur and thus a suspension forms. The resulting suspension is then divided into moist crystals and solution in the centrifuge Z. The solution is fed back to the plant by the re-feeding unit RB and RP, the salt is dried in dryer T.
Low energy costs, since only a fraction of the evaporation energy has to be used in the form of electrical energy. Normally only electrical energy is required as an energy source. Normally no steam is required in normal operation, but only for starting up. No cooling water is required for vapour condensation. With several fans or with turbo compressors. With or without vapour scrubber.